– Children’s rhyme for playing skipping rope. Shardlight is an adventure video game, published in 2016. Said publisher is Wadjet Eye , a tiny Brooklyn studio with a solid reputation in this genre. The game itself is by Francisco González and Ben Chandler . This game uses high-end pixel art and painted backgrounds. It has a typical old school “point and click” gameplay. That is, raking one’s brain to find creative solutions to contrived problems, using random found objects and a keen eye for details. This profile has very few S P O I L E R S about the in-game events, or the facepalm-inducing ending. On the other hand it lays out what is known about the setting. Real Name: Amelia Grace Wellard. Known Relatives: Cooper Wellard (father, deceased), mother (name unrevealed, deceased). Group Affiliation: None at first. Base of Operations: An unnamed post-apocalyptic city. Amy is good with her hands, and a trained mechanic. Fixing pumps or cars is easy for her. Her manual dexterity and mechanical smarts also allow her to jimmy open simple locks using improvised tools. She has a gift for improvising solutions using her environment – and random crap she can find laying around. This is a combination of keen observational skills, an engineering mindset, and mechanical skills. However, her Green Lung infection results in random spurts of sharp pain and breathing difficulties. These come with little warning, and can readily be recognised as Green Lung by those familiar with the disease. Ms. Wellard seems popular and trusted by her neighbours. These include a greengrocer, a butcher, a potter, a junk dealer… plus a ne’er-do-well kid who’s a good artist and forger. Amy has above-average willpower and courage, but nothing exceptional either. She just does what she can. She’s oddly adept at climbing up ropes. She’s also a surprisingly good shot with her trusty light crossbow. 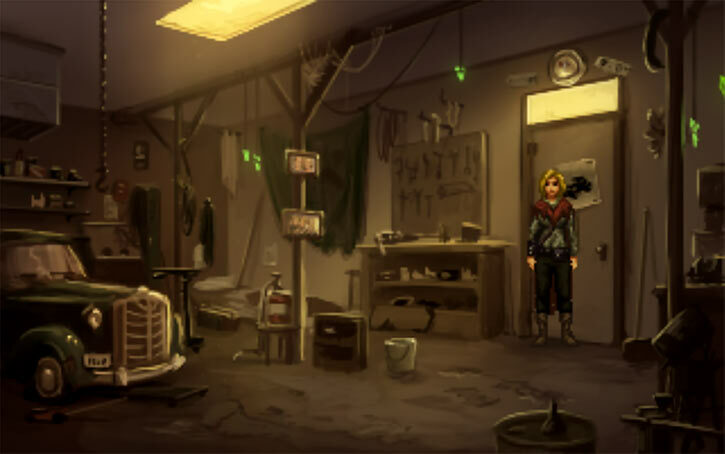 If she has time to aim, she can reliably hit trick targets such as buttons, switches, ropes, etc..
Shardlight takes place in a spot-apocalyptic setting, 20 years after a nuclear war. Almost everything is ruined. Society drastically changed, but it was a survivable war. The setting is grim. Not as much as horrible stuff like The Road or Threads , but still pretty bad. However, a recurrent theme is maintaining hope and sticking together. It is tempting to compare it to Fallout. 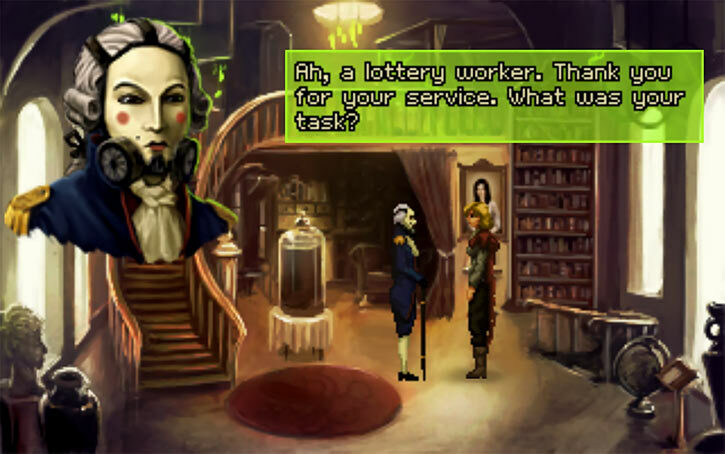 But Shardlight has a recognizable and productive society, rather than Mad Max stuff. So it’s closer to a relatively nice but dictatorial area of Fallout, such as Vault City. There are also clear Dishonored influences. 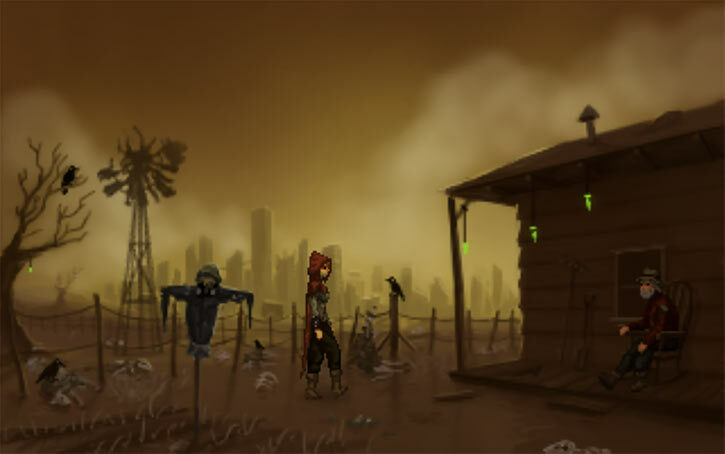 The game takes place in the late XXIst Century, two decades after World War Three. The war was sparked between the Socialist Powers of Asia and the Oceanic Republic over oil in the Pacific. This timeline had many differences from the real world’s. Yet it also had a WWII, Cuban Missiles Crisis and Gulf Wars. Many of the details of the pre-Blast Day world (posters, photos, cars, some hairstyles…) evoke the 1940s. Small nuclear reactors feeding key nodes of the power grid. Bits of 1990s clothing like hoodies with zippers. A reference to what may be a robot farmhand. A 2003 car looking very much like a 1920s car, complete with runboard. A surviving electronic system in a government building having a tactile screen, voice recognition and voice synthesis. That the best firearms seem to be flintlock smoothbores. Hobby shops having model airplane kits with remote controls and miniature electronics. The trains are 1940s models . But these locomotives, in the real world, remained in service for decades. Though there apparently wasn’t a nuclear winter, there’s a *lot* of dust still suspended in the atmosphere. People routinely cover their mouth and nose with fabric. Even in the middle of the day the lighting is closer to dusk. Lighting has a yellow-ish tinge from the sand. It is thus common to hang shards of “uranium glass” within and near buildings. The UV light from the sun will make them glow green – hence the game’s name. Shards are even more useful since wood is rare. It is not uncommon to go for a day or two without being able to afford food. But people do their best with what they have, and can generally hover around the subsistence level. All survivors live under constant threat of the Green Lung disease. If somebody gets too sick, they will be sent to the Quarantine Zone to die. This seems to be the leading cause of death. Wealthier people, who presumably use pre-War styles, have clothes, lifestyles and houses that strongly evoke the 1920s and 1930s. The rift between their lives and the lives of the subsistence class — Amy Wellard and her ilk — is stark. This death cult sees dying as being freed from a harsh life. They believe that a divinity called the Reaper sends ravens as his messengers, and heralds of death. A farm near the City. In practice they’re a church for desperate, and often grieving, people. They yearn for a community and hope that they’ll get to die soon to join their loved ones and be free of pain. Many worshippers have a terminal case of Green Lung, and the Cult is one of the very few place they can receive solace if they don’t have access to the vaccine. Many wear a top hat to advertise their status as Reaper cultists – particularly those who proselytise. “May death come to you swiftly” is their salutation. They are based in a cathedral that was the site of a plane crash on Blast Day. Since hundreds died — both aboard the passenger airliner and within the cathedral — and were thus spared life in the post-apocalypse, the Acolytes of the Reaper consider the site blessed. The Aristocracy formed soon after the war. They obtained the backing of the wealthier survivors, allowing them to control much-needed resources and ensure obedience. Their leader was a former government minister. He was left somewhat unstable after Blast Day and determined to prevent further wars at any cost. There have been several attempts at rebellion, but they were all crushed while still at the small conspiracy stage. Having the remedy to the deadly Green Lung disease is also a key part in ensuring the Aristocracy’s power. The vaccine doses are rationed, but people can volunteer for dangerous jobs to obtain lottery tickets. A lottery is then periodically held, and the winning ticket gets the shot. Four Ministries are featured in the story – Energy, Knowledge, Medicine, Resources. The overall leader is the Minister of Energy, Tiberius. He projects a specific persona – Roman Emperor moniker, Ancien Régime aristocratic clothes, and full-face gas mask painted like an aristocrat’s porcelain mask. The guards have Revolutionary Era uniforms – think Redcoats. Officers presumably have powdered wigs, since the guards are called “wigheads” by rebels. The Aristocrats’ guards use flintlock weapons and bayonets. This is interesting, since as discussed in our improvised firearms article more sophisticated firearms aren’t too hard to produce. Perhaps there’s something in local physics about gunpowder going “stale”. Or interfering with blasting caps. Most other people who go armed will have but a light crossbow. One person is seen with some sort of shotgun, which she’s nicknamed “Ol’ Bessy”. This likely is a reference to Brown Bess muskets. Elite fighters will also have a sword. From the more common first names, the action takes place in what’s left of a Western country. The population is diverse, and some of them are from Eastern Europe, the Philippines and other areas. The country’s history involved colonisation by the British, or a close equivalent. Though nobody has Crocodile Dundee or Miranda Lawson accents, the game seems to take place in the equivalent of Australia. Perhaps the city of the game is the remains of the capital of the Oceanic Republic ? Plus, one character is named “Bruce”. What more proof does one need ? This Steven Wilson album was a major inspiration for various game elements. And yes, it’s a very prog-rock sound right here, I agree. Amy was but five on Blast Day. She has next to no memory of the world before the bombs. Her mother died during the bombings. She was taught mechanics by her father. One of her long-term projects is to repair his old Quicksilver car. But she has reached the point where she needs rare spare parts to progress. 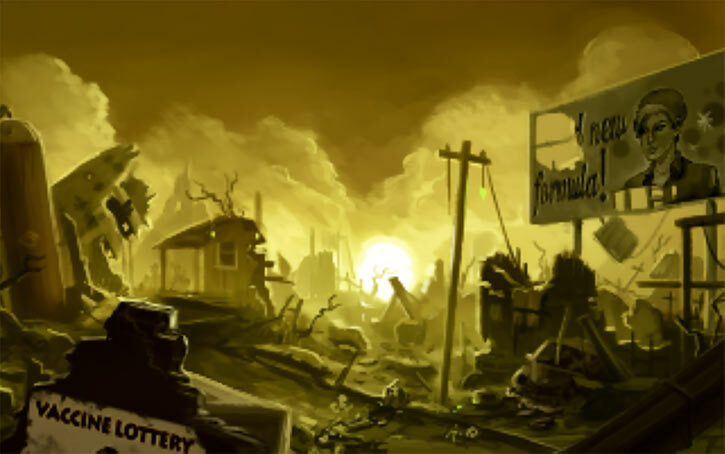 (Repairing the car might be a reference to Fallout II, since the game has references to Fallout III). Amy works as a freelance mechanic and fix-it-woman. Though she does apply for government jobs, she seldom if ever gets those engagements. As the game opens, Amy has been sick with the Green Lung for a week. For now it’s discreet – but her life is very much under threat. She has no choice but to start doing lottery jobs. Hopefully she’ll survive those, and hopefully she’ll earn a winning ticket. The first lottery job we see involves restarting a crumbling nuclear reactor that has gone offline. But once inside, Amy realises that she’s not the first person who has been sent in. Her predecessor is mortally wounded and pinned under rubble. However, the man is still conscious. Recognising her as Cooper Wellard’s kid, he helps her complete the job. Knowing he’s done for, he then convinces the extremely reluctant Amy to give him a mercy kill with his own crossbow. He also entrusts her with a letter, to be given to a certain “Danton” at the marketplace. What could this be all about ? Amy is an underfed lass in ragged yet practical clothing. 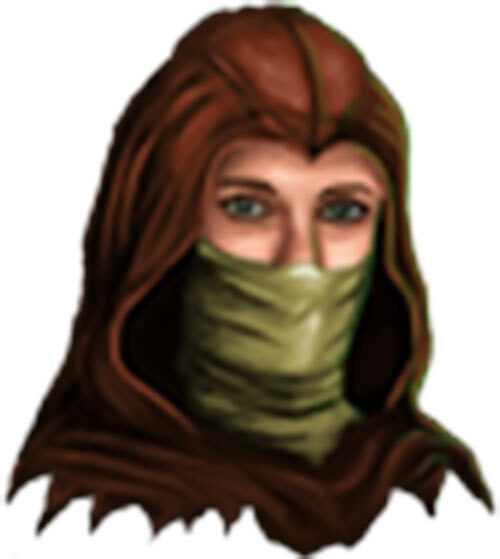 When outdoors she’ll cover her head and lower face with a red hood, for protection against the dust. She is voiced by Shelly Shenoy . Ms. Wellard is a kind and empathic lass. Though she’s well aware that she lives in a harsh and unfair world, her inclination remains to help her fellow survivors. She can perform unsavoury deeds, but she will exhaust all alternatives first. Amy is not in-your-face assertive, both as a matter of personality and out of general caution. She’s a wary post-apocalyptic survivor, not a loudmouth. She’s also a pragmatic and social person. However, as the story progresses, she has to harden and come to consider politics. Beyond hand-to-mouth living, Ms. Wellard would like to repair her father’s car for good. Finishing what he’d always wanted to would be a powerful symbol of filial loyalty. However, she’d unlikely to ever do that. Finding the parts just isn’t realistic. Misc. : Amy has an early case of Green Lung, Misc. : Some things that would be obvious pre-apocalypse (say, what a tram does or the concept of a subway) aren’t to somebody who was but five on Blast Day). Light crossbow [BODY 01, Projectile weapons: 03, Ammo: 01, Very Long Reload Time]. Amy is unlikely to have more than one or two bolts. But if possible she’ll angle her shots to have good chances of recovering her bolt. Amy’s garage/workshop has a full set of tools, which took a lot of effort, plus salvaged junk and odds and ends. It might count as 4 APs of Laboratory, but it is never used in this way in the game. Amy in her garage workshop. The INT and WIL score are high-ish, though not quite heroic. This is because implementing point-and-click-adventure-game solutions in a realistic world would be… involved. Presumably the gameplay is stylised a bit, and what actually occurs in-universe is less abstruse. And Shardlight doesn’t have a tonne of cryptic moments by genre standards. But still, the action has to involve many unusually sharp deductions and observations. 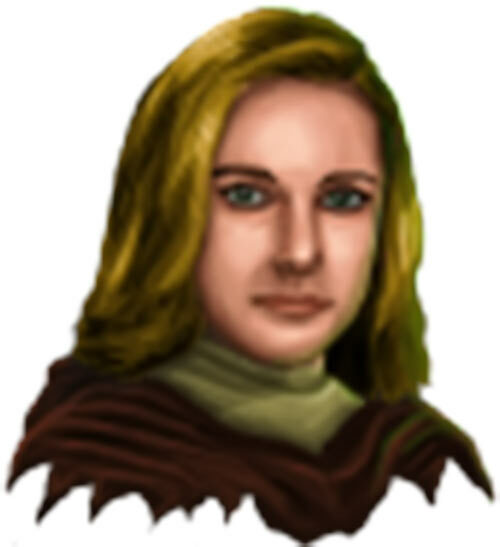 Source of Character: Shardlight video game. Helper(s): Darci. I also used the walkthrough by SonataFanatica to expedite things. Writeup completed on the 10th of December, 2018.